One of the few drawbacks to our Aphrodite 101, Averisera, is the low main hatchway. If we swamp, a lot of water can make its way quickly into the interior. Our hatchboards are fine for near coastal work. We have stress-tested the boat's ability to swamp and recover and find ourselves satisfied... in a general way. Bascally, Averisera is hard to lay over on her side and swamp. A wave breaking over the side is another matter. With low freeboard, a boarding wave is very likely. That is the problem to solve. The cockpit must be improved in a few ways. One is to improve the height of the "bridge deck" or entrance sill. Another is to add cockpit drains. The engine hatch in the cockpit floor is a whole other matter. Here we are at the end of October 2014 and I measured for a hatchway revision. I think a securely fastened and caulked plexiglass slider will do the job. The height is not too much inconvenience. The grass we planted is growing. Not a sure thing when we put the sail and seed down. 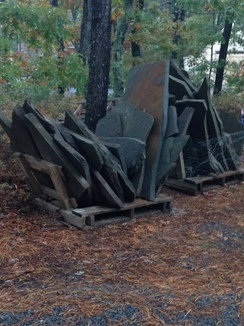 The new flagstone rocks are here. We will have something to do this winter, lay stone. Norman graduated from St Andrew's School in Boca Raton, Florida back in the 1960s. Back when Florida was a quiet agricultural state. The school was located out in the "boonies" as we called the endless expanse of vegetable fields. Now, the farms are gone and tourists are the industry. The school is bigger and sleeker than it was in my day. Hard to recognize anything beyond a few familiar road names. Anyway, there was an event at school honoring the 1964 swim team of which Norm was a minor part. 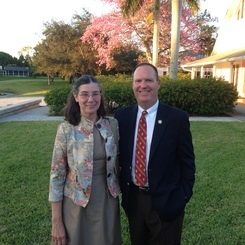 Elizabeth and Norm drove to Florida and attended the ceremonies. At school, outside the chapel. 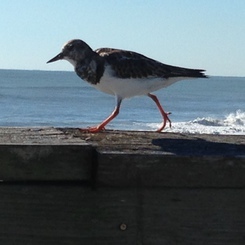 Ruddy Turnstone on the pier at Amelia Island. Very secretive birds up North, friendly in the South. Norm saw a lot of these in Anegada, BVI years past. 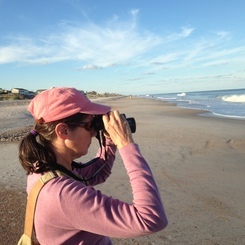 A rare sighting of the Great Northern Birdwatcher on the beach at Amelia Island Florida. 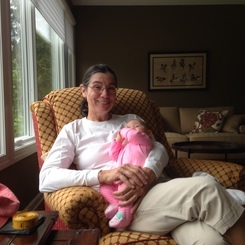 Elizabeth with our newest family member, Evelyn Bradicich. Evelyn's mom is Norm's sister, who is the mother of the baby's father Jason. The mom, Holly, looks beautiful and they are both such good parents as evidenced by Evelyn's behavior. She is so good. Every time I peel paint off a boat bottom it is the last time, or so I say at the time. THe most recent one before the current project was the Beneteau 44, Three Harkoms we refitted for the Caribbean racing circuit back in 2006. So, with a weak memory, I undertake another bottom stripping adventure. We use Interlux Micron Shark White bottom paint. 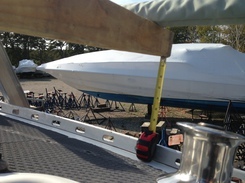 I am striping with a West Marine product that is very satisfactory. (no financial interest in the product) It is applied with a roller as a blue goop. When ready to be stripped, the goop turns green and I scrape it off using a 3 inch chisel edge scraper. 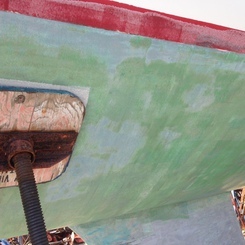 On the port side, two applications have resulted in almost all the paint being removed. 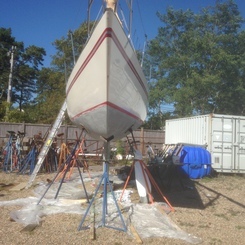 The starboard side is pretty much the way the boat came out of the water. I expect three applications per side. I use one half gallon per application per side. It takes about two hours to roll on a coat and scrape it off. I am calling it good exercise. Before and After images. 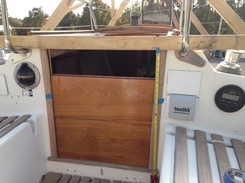 Top picture is with port side striped back with two applications and starboard side untouched. 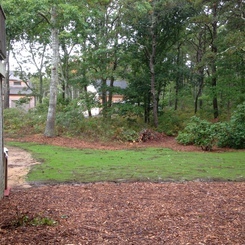 Lower picture shows the starboard side after two applications of stripper. A couple more applications on both sides should finish the job. The stripping o fthe first application is always the toughest. Subsequent applications are easier. Then, I start longboarding for fairness. 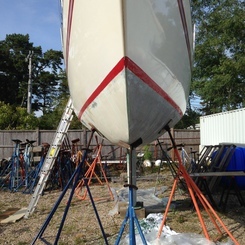 The white is original paint finish as hauled and after pressure washing. The green stripe is the "ready look." and the Grey is stripped surface. 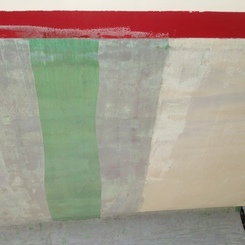 The mottled look is due to the stripper not affecting the barrier epoxy. The green is bottom paint. Note the white color on the boot stripe. Stripper goes on blue and turns white on the regular enamel paint. The West Product is Back To Nature. One of the nice aspects is easy cleanup of the peelings. But: We are catching up. 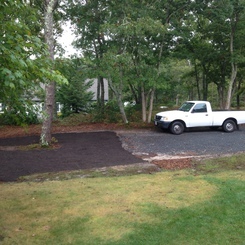 Ten cubic yards of loam and grass seed are big improvements. The lower yard was done after the 22nd of September and came up nicely. We did the upper yard on 4th of October. Hope for same results. 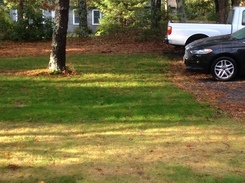 The neighbor's yard is stunning which is what happens when sod and irrigation are involved. 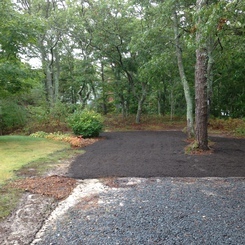 Ended drive at blue stone and created a lawn that will extend down the hill and to back yard. We can walk down steps to back yard on one side of house and drive over lawn to back yard on other side of house. After all this work, someone's going to need a compelling reason to drive on the grass! 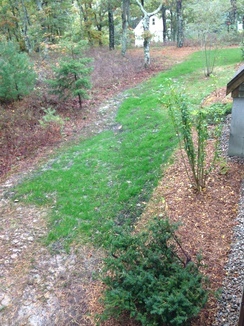 The back yard a week or so after it was seeded. 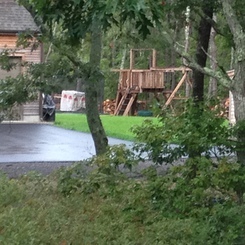 Mulch from tree removal and chipping has been spread around the lawn. 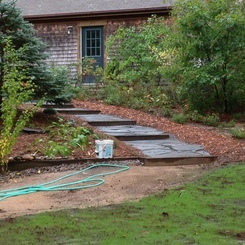 Stone walk and mini-patio to be installed in sandy space on left. Stone walk will extend around the house. Haven't bought the stone yet. That will be a job and a half for us. Next door is perfect. We are catching up. Upper lawn area, another view. Plan to patch the blue stone which will finish the entrance nicely.